Foster Regals Cod Liver Oil is molecularly distilled and manufactured under strict quality control standards. It is tested to be free of potentially harmful levels of contaminants (i.e. mercury, heavy metals, PCB’s, dioxins, and other contaminants). 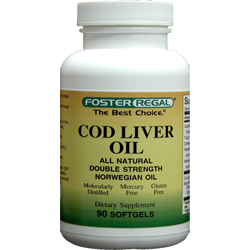 Cod liver oil is a nutritional supplement derived from the liver of cod fish. As with most fish oils, it has high levels of the omega-3 fatty acids, eicosapentaenoic acid (EPA) and docosahexaenoic acid (DHA). Cod liver oil also contains vitamin A and vitamin D. It has historically been taken because of its vitamin A and vitamin D content. It was once commonly given to children, because vitamin D has been shown to prevent rickets and other symptoms of vitamin D deficiency. Other ingredients: Gelatin, vegetable glycerin, corn oil.